Have any of you seen a large tree? No, I mean really big….Huge. GIANT. 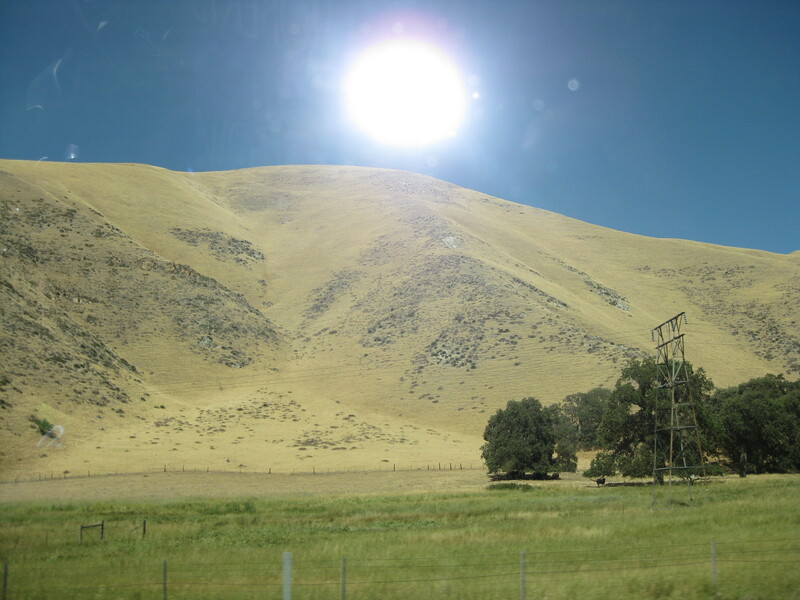 Larger-and-never-more-grand-a-sight-had-you-seen-with-your-very-own-eyes kinda big…. Well, not until Carl took us to the Sequoia National Park. This was one of the biggies for us. It’s one of the places that we heard about or read about but have never had the chance, or took the time, to go see. And now that we were in the area (sort of) we headed off in a Northerly direction. The drive from San Diego to the park was supposed to take about 5.5 hours. Now, you have to understand that, at nearly a year in, the Awesome’s Departure Time is around 11am. No matter what time we wake up or start tearing down, we never seem to get on the road until around that time. Because of that, and because four bladders don’t fill up all at the same time (Daddy’s doesn’t count, he’s a camel) we try to keep our travel time to about three hours. That’s three hours of normal travel time. What takes someone else three hours can easily take us five or more. But I digress. We left a bit early this time. As in: hooked up, gassed up, breakfast done and “huh…it’s only ten!”. Cool. We should get there around dinnertime. …and I found out that we were not going to be camping IN the park. They didn’t have any hookups. It would be dry camping if we could even fit in the available campsites. We are having a few battery/charging issues right now that Carl’s working on, so dry camping for longer than a night really isn’t in the cards right now. Plus, with five people that need to shower, it’s the grey water holding tank that fills up pretty fast. With no hookups, there’s no dumping which means we’d be traveling with a full tank of dirty water and no way to shower on day two. uhhhh, no. 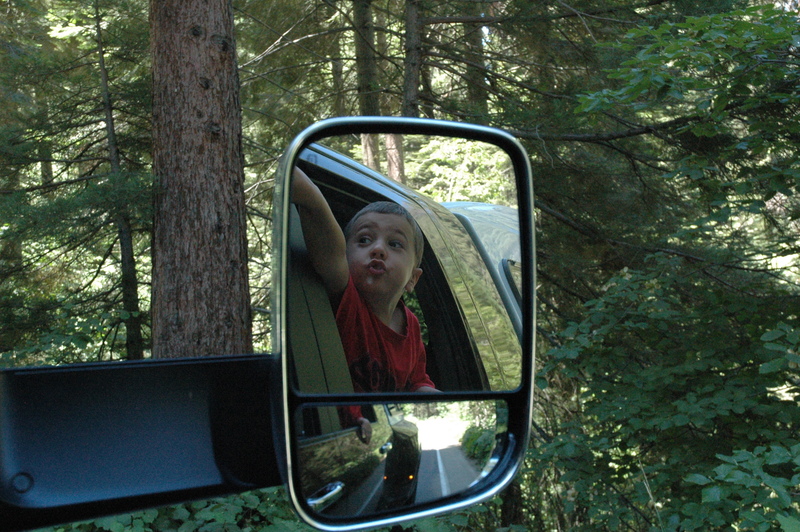 We lucked out and found a campground about three miles from the park entrance. So, we booked for three nights at Three Rivers Hideaway. Now, if you’ve clicked on the link, let me tell you that it doesn’t exactly look like it does on the website. But in all honesty, I don’t think any of them do. But, it had partial hookups (electric and water) and decent bath houses. And for three days we can do just about anything. Plus there was a diner across the street, the park was three miles away, and it was quiet and secluded. After Carl parked the camper, which took forever because I’m a little on the picky side, the kids got their first taste of the language barrier. There was a large family on vacation from the Netherlands (I think) and the children there didn’t speak fluent English. It gave the kids a clue as to how hard it is to speak to someone when there is no common language. On to the trees! I know you’re anxious to see the pictures of the giant trees…but first lemme tell you that before we hopped in the truck to head to the park, we went over and had some breakfast at the diner across the way….if you ever come across a side-of-the-road diner at breakfast time and there’s a ton of cars in the parking lot…just GO. It’s probably really good! It’s really hard to explain how big the trees really were. So I’ll just post a few photos for you to get some perspective. It was simply awe inspiring. 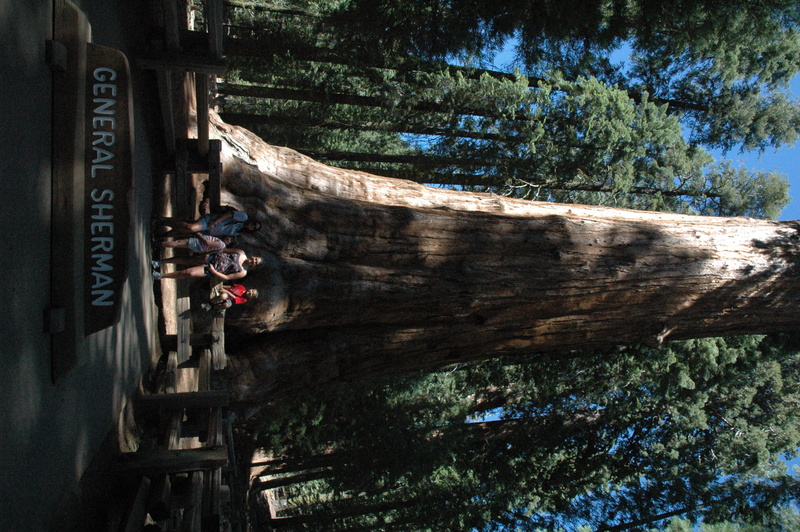 The General Sherman Tree. 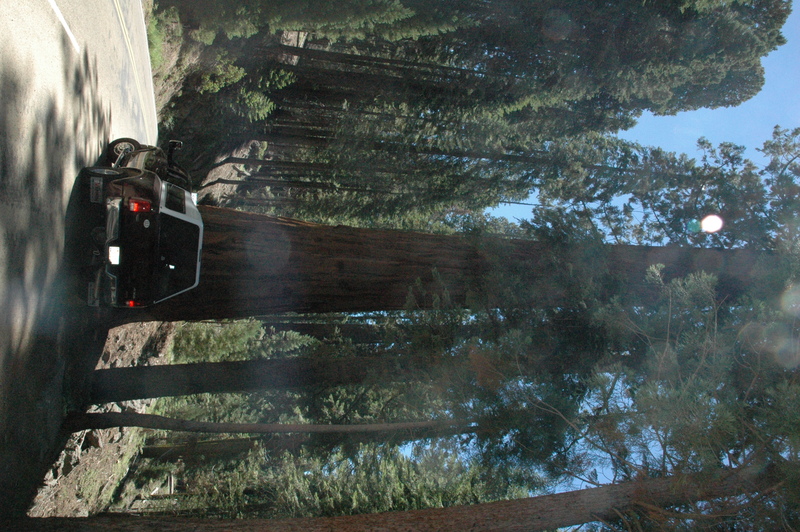 The largest Sequoia. T.A.F.V in front of a big tree. Now THAT’S a big tree! 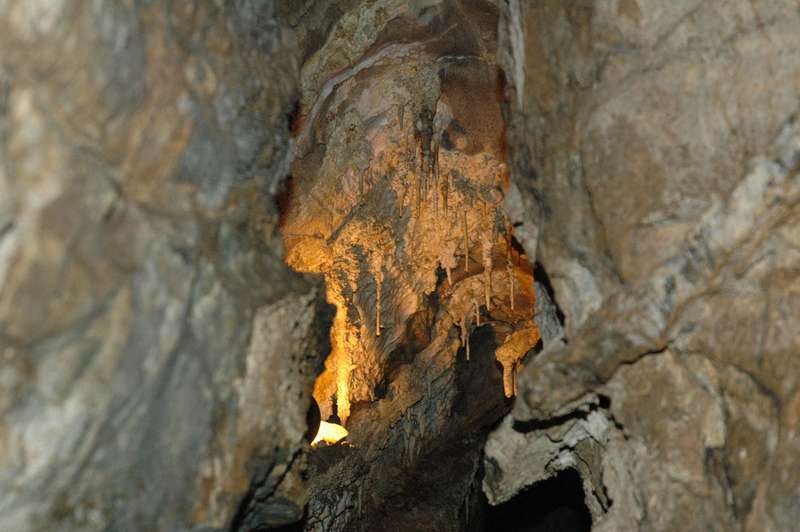 We took far too many pictures to post here about the inside of the cave. 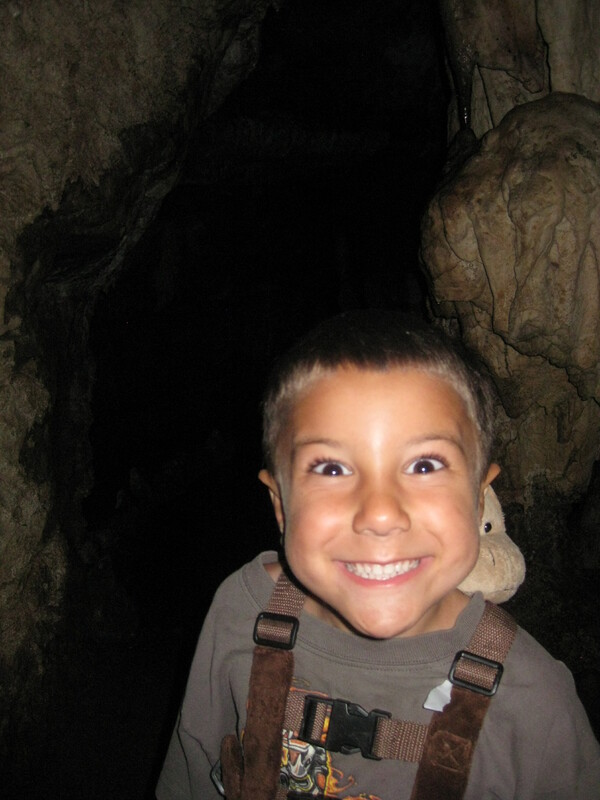 But if any of you have the chance to do a cave excursion, I highly suggest it. 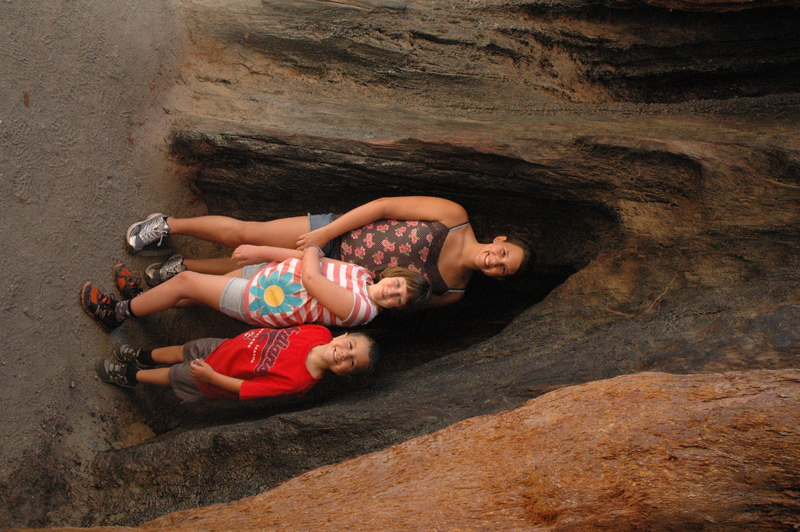 The kids learned about granite caves, cave bacon, stalactites and stalagmites, and a little about some creatures that live in total darkness. Yeah, did I mention that they turn the lights out? And it’s COMPLETE darkness. Not the have-to-wait-until-your-eyes-adjust-so-you-can-stumble-through-the-house, but total darkness. The guide left the lights off until someone cried uncle. Creepy. 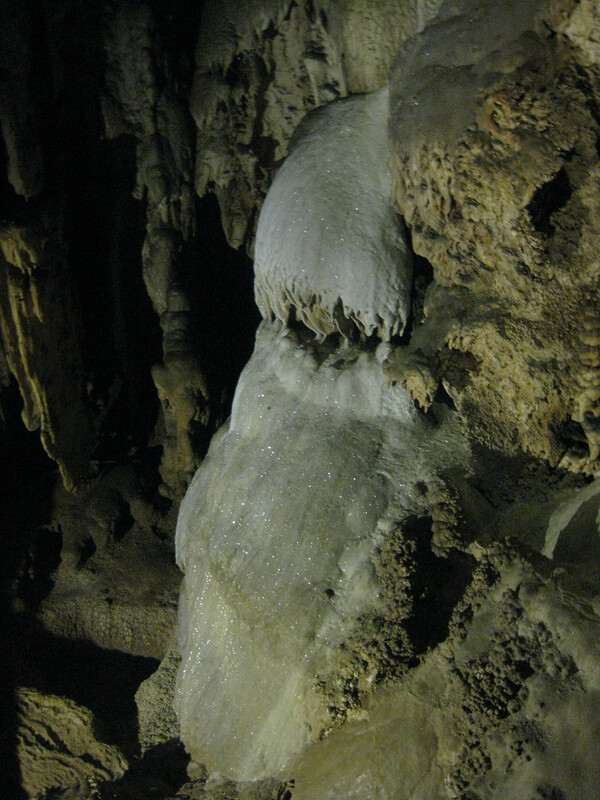 Here’s a few pics of the cave formations. The last post worthy thing we did was something that Grace and I wanted to do. 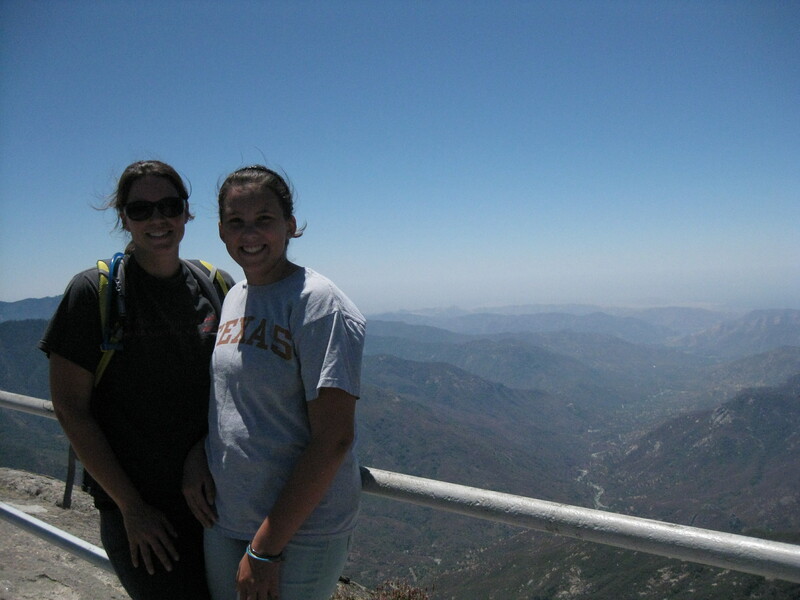 The flunkies stayed in the truck…we decided that we wanted to climb to the top of Moro Rock. There are over four hundred steps in the stairway that is listed on the National Register of Historic Places. After we climbed to the top, we were treated with a view from 6,725 ft, that showcased not only the park, but also the Great Western Divide. Completely amazing and worth the killer workout! The Sequoia National Park was simply amazing. It had a bit of everything for everyone. Carl’s the ”take a drive” kinda guy, and the kids and I like to get out and run around..so we all were quite happy with our experience there. I think on our next trip we will head up to the northern part of the park and see what kind of sights we can see there. The park office ranger said that the drive through the Kings Canyon part of the park was one of the most scenic drives she’d ever been on…..we’ll see! Stay tuned friends, we have some amazing photos to share from the next days drive!! reminds me of my childhood. you got to throw in Zion national park one of these days- good driving action for Carl. simply beautiful!